This is a simple but nice summer house built by the architect Manel Joaquim Raspall i Mallol in 1907. The big originality of it are the façades totally in stone (a not common materiel for that type of buildings in Mediterranean areas). Only the pillars in brick in the corners and window cases shown a variety in materials. Instead of that austerity the building has a special taste compared with other summer houses built by the same architect Raspall. 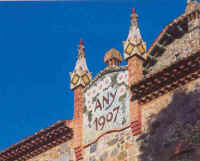 The panel with two pinnacles on south façade give additional color to the exterior with its coverage with trencadís (broken ceramic pieces) making vegetal and geometric designs, and including the building construction date – Any 1907 (year 1907 in Catalan language) -. On main the façade it is a balcony, supported by two echeloned brackets, covering the door as a canopy covered with a floral designed trencadís . The roof made in Arabic tiles has four slopes and is surpassed by a tower with two symmetric chimneys. The elements in wood are curious specially on windows and external fence. The part in wood of that fence is supported by a stone base and the top of pillars are covered with designed ceramic. Private owned house. Visits are not possible to the interior. 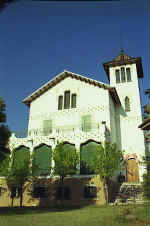 Summer house built by Manel Joaquim Raspall i Mallol in 1910 into the area around of the Passeig (Promenade) who is the residential summer area of La Garriga. The style of that house is Art Nouveau with baroque influences. The house is in bad condition, but it is possible to see, on the façade to the Guinardó street who is the main body of the house, a pediment with four pinnacles crowned by a border made in trencadís (broken ceramic pieces) following the shape of the roof covered by ceramic tiles with geometric designs. The other two house bodies are covered by terraces, the left one adorned by a pergola and the right one over an iron forged door with two columns covered by mosaic and two panels with vegetal designs made by Lluís Brú. The windows are protected by gratings in forged iron with designs following the Art Nouveau “coup de fouet” style. The house is private owned and it is not possible to visit the interior. House built by the architect Lluís Planas i Calvet in 1909. This building remember the Josep Puig i Cadafalch style but reflex the personality of its architect Lluís Planas, and is a typical Art Nouveau summer house. Build out both of the historical and summer residential centers of town, his location is nevertheless common in the summer houses of that period: near of the railway station into a very quiet and relaxing area. The façades are in white stucco with floral graffito’s around the windows and straight borders of ceramic buttons over the special and elegant windows of front façade and between second and third floors of main building body. The roof covered by green ceramic tiles with geometrical designs surpasses largely the building walls with a gable-end supported by brackets and a decoration of geometric elements between them. The tower is the structure to lodge the stairs. The interior is also interesting showing crystal decorated elements, white and blue ceramic banisters and a fireplace. The house is in very well condition. At present the house is occupied by an educational institution and visits are not possible to the interior. Small urban building covering different social needs. The most interesting is the façade in late Art Nouveau style with renaissance style elements specially on top. Over the three central windows there is the coat of arms designs of La Garriga and Barcelona on both sides and the year of construction on the middle. At present used only as cinema and commercial purposes on ground floor.